About four years ago I had the opportunity to try PC Jammin’ Jamaican Lobster Bisque, which is a frozen entree that was created by Winslow Taylor of Mississauga, Ontario for the PC Recipe to Riches contest. I loved it! It was creamy and filling with just the right amount of bite. Sadly, this frozen dinner didn’t stay on the shelves long, and it has been years since it’s been in production, I think. So a I did some research and some testing, and I came up with what I consider to be a really nice non-dairy Caribbean-style lobster bisque that you can make in a slow cooker. I originally posted this recipe in my old blog a few years back, but I’ve had the chance to refine it somewhat since then. Enjoy! Saute until the onions are clear. Stir often so that they do not brown. Put sauteed items in slow cooker. Reserve the remaining meaty parts of the lobster tails for later. Add the fan part of the lobster tails to the crock pot. Stir. Cover and cook in the slow cooker for 6 hours on low. Remove and discard lobster tail ends & thyme. 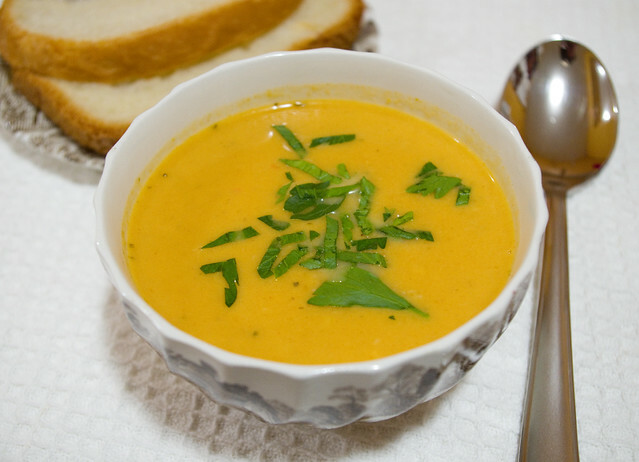 Using a blender or food processor, puree the soup until it has an even, creamy consistency. Put the soup back in the slow cooker, and add the reserved meaty parts of the lobster tail. Stir, cover, and cook for about 45min to 1hr, or until lobster shells are pink and meat is cooked through. Remove remaining lobster from the slow cooker and let it cool until it is comfortable to handle. Remove lobster flesh from the shells. Discard shells. Chop lobster flesh into small bite-sized pieces and add to the slow cooker. Stir. This bisque is delicious as an appetizer or as a lunch. It freezes well; I like to freeze it in single-sized portions so that I can take it along with me for work lunches. It goes well with crusty bread and strong cheese. * Equal quantities of winter squash puree such as butternut, calabaza, or Hubbard squash may be substituted. ** When I can my own squash, it comes out much more watery than the commercial canned versions. If you are using a thicker canned squash, add enough water to the mixture in the slow cooker so that it has the consistency of a thinner cream soup. This amount will vary depending on the consistency of the puree. *** If you use regular chicken broth instead of the reduced-sodium version called for in this recipe, omit the salt. If you use homemade chicken broth with no salt at all, add an extra 1 tsp salt. **** If you can get it, smoked paprika adds an extra layer of flavour to this recipe. Otherwise, regular paprika will do. ***** I used the Scotch Bonnet hot pepper sauce made by Grace (which is available at most grocery stores around here), but you can use the one of your choice. My original recipe called for 4 tsp of this sauce, but it ended up too hot for anyone in my family except me. If you like your food spicy, add a little more than 2 tsp. If you aren’t that fond of spice, cut it down to 1 tsp for a tiny bit of a bite. If you don’t like spice at all, you can omit the sauce altogether for a mild bisque redolent with coconut – although if you do this, I’d recommend adding more thyme. ****** I have used lobster tails to make this soup, I have also done it with satisfactory results with other (cheaper) parts of the crustacean, like the claws. Just set aside the bigger, meatier parts for the last step of cooking, and use the smaller, mostly-shell parts for the slow-cooking stage to add flavour. Remember to take any parts with shell out before you blend!